Belikin Calendar 2017: It’s all about the Beer, Beauties and Bars! Belize’s most popular beer is the Belikin Beer. Brewed and bottled in Belize by the Bowen & Bowen Company, the Belikin can be found in bars across our beautiful country. Visitors and locals alike enjoy the beer at home, on the beach, and a most favorite pastime of all, at their favorite watering holes! What else is top on the list of best things about Belize? It’s beautiful people of course! Well the smart people at Bowen & Bowen decided to combine the beer, the beauties and the bars into one spectacular 2017 calendar. Printed since 2001, the 16th issue of the calendar takes viewers through various fun locales around the country. Highlighting favorite watering holes are the bikini-clad Belizean babes holding their favorite: Belikin! Whether it’s the Lighthouse Lager, Belikin Premium, Stout or Regular beer, the brown and green bottles are highlighted throughout the photos depicting the classic locations that people know and love. Beyond releasing the calendars, Bowen & Bowen also hosts a fabulous launch party to unveil the beautiful calendars. For a small entrance fee to the venue, fans get a copy of their calendar, and even get to meet the calendar models. The friendly, smiling chicas are happy to sign copies, posing beautifully next to their fans! I got to attend this launch, and I am delighted to report that two of the models in this newest issue hail from San Pedro Town! Dianira Rivera and Daisy Caliz have put La Isla Bonita on the map, photographed at the iconic Palapa Bar in San Pedro. 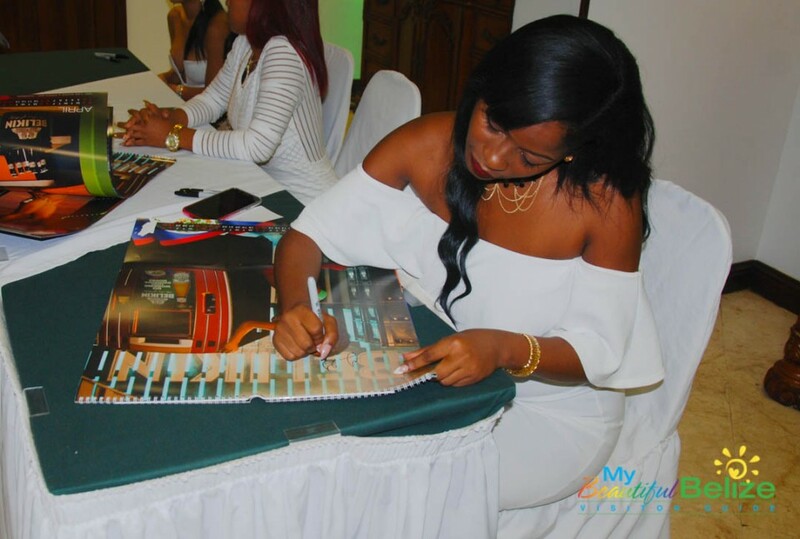 ALL the models are absolutely stunning in their own way, and we give kudos to Belikin for highlighting our beauties from around Belize!